Comic Book Cover of the Week! Golden Age Hellboy!! Hellboy and the BPRD have both moved up the ranks these days as probably my favorite comic book series currently on the market! The reason for that being really being one man, Mike Mignola! Mignola is a visionary, he’s been doing comic books for ages and his artwork is unmistakable. He has always been a fave of mine since the 1980’s and his Hellboy universe has grown extensively through the years. I am personally surprised at how many of my friends that read comic books still AREN’T reading the Hellboy and BPRD stuff! 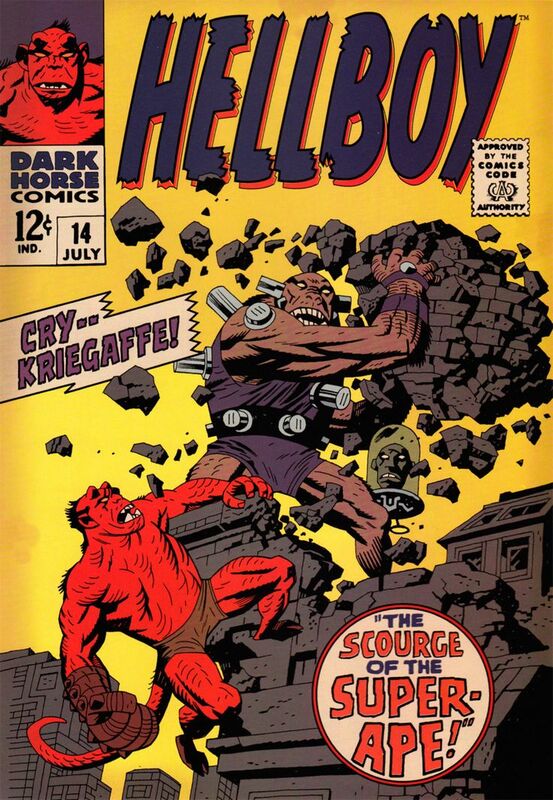 It’s better than anything Marvel is putting out that’s for sure-here’s one of my fave Hellboy covers-number 14 where Mignola creates the Golden age Hellboy! !